Radiography is the use of X-rays to image the body for diagnostic purposes. Using an X-ray machine, X-rays are passed through the body or part of the body and an image is recorded on the opposite side using photographic film (classic radiography) or electronic X-ray detectors (digital radiography). The body is made up of various substances with differing densities. X-rays, or radiographs, can be used to reveal the internal structure of the body on film. This is done by highlighting these differences in densities using the absorption of X-ray photons by the denser substances such as bones. A radiograph image is different shades of gray, with bones being the lightest (white) and air the darkest (black). Not only bones can been seen on a radiograph, sizes, shapes, and positions of internal organs, foreign objects in the body, and gas accumulation are examples of other things that can be visualized using radiographs. Nuclear Scintigraphy, or bone scan, is a diagnostic test using radioisotopes. 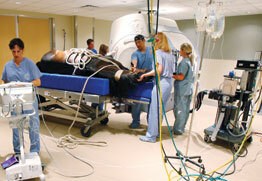 Bone Scans are performed on a standing sedated horse. The camera moves around the horse on a rolling system that is quiet and easily adjusted to a variety of positions. Scintigraphy involves the use of a bone-seeking isotope that is concentrated in areas of increased bone activity that is found with arthritis, infection, fracture, or soft tissue injury that is closely associated with bone. The radioactive chemical is injected intravenously into the patient and can be viewed by a gamma camera that counts the isotopes and converts the counts into an image. 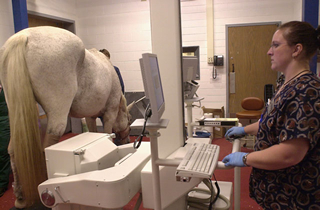 Scintigraphy studies are useful for diagnosis of lower limb lameness and upper limb/axial skeletal (back, neck, pelvis, shoulder) injuries that cannot be evaluated with radiographs. An ultrasound machine works by emitting a beam of sound waves from an ultrasound transducer into the body tissues. The echoes bounce back to the transducer and are converted into a black and white picture by the ultrasound machine, called a sonogram. Ultrasound imaging, referred to as ultrasonography, is used to get an inside view of soft tissues and body cavities, without using invasive techniques. Ultrasounds can be used to visualize muscles, tendons, and many internal organs, their size, structure and any pathological lesions with real time images. Ultrasound cannot penetrate bone or air but can help image the surface of bones or air-filled structures. It is also used commonly to visualize a fetus during pregnancy. Fluoroscopy is an x-ray procedure that makes it possible to see internal organs in motion. Fluoroscopy uses x-rays to produce real-time video images. After the x-rays pass through the body, instead of using film, they are captured by a device called an image intensifier and converted into light. The light is then captured by a TV camera and displayed on a video monitor. A computerized tomography scan, CT, or CAT scan, uses a computer to generate a 2-dimensional cross-sectional image. Using the same dosage of radiation as that of an ordinary X-ray machine, an entire slice of the body can be made visible with about 100 times more clarity with the CT scan. 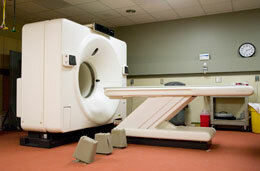 The CT machine rotates 180 degrees around the body. The machine sends out thin X-ray beams which are picked up and recorded on the opposite side as absorption rates of the varying thicknesses of tissue and bone. CT has become an important tool in medical imaging to supplement X-rays and medical ultrasonography. It has more recently begun to also be used for preventive medicine or screening for disease such as cancer. The MRI uses strong magnetic fields and radiofrequency pulse to produce images with superior soft tissue contrast and excellent detail. 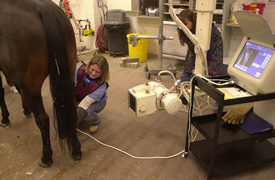 This imaging technology facilitates the diagnosis of disease in the head and lower limbs of horses.